Architects are the licensed professionals trained in the art and science of building. They are involved in all the phases of the building construction i.e the functional, safety, economical and has to satisfy the needs of its occupants. They are responsible person for the planning, designing and supervision of construction works for houses, office buildings, skyscrapers, landscapes, and even entire cities. An Architect is a combination of artist, professional and businessperson. They ideates, sketches, makes blueprints of their designs and then sees them come to life as cottages, skyscrapers and even monuments. Apart from designing and construction, architects are trained in activities ranging from conceptual problem solving to project management. Bachelor's degree in architecture (B.Arch) or Diploma in architecture. The basic eligibility criteria for B.Arch is 10+2 (senior secondary Class XII) or equivalent referred to as the qualifying examination from a recognized Board/University with a minimum of 50% marks in Science subjects (Physics, Chemistry and Mathematics). Besides this, the candidate must qualify an entrance examination. Admission to first year of Five years full time undergraduate course in Architecture (Bachelor of Architecture) in various colleges of India is through National and State level entrance examinations. The CBSE conducts a national level entrance examination- All India Engineering Entrance Examination (AIEEE) on an All India basis for entry to undergraduate programmes in B. Architecture and B. Planning in government and private institutes. The paper consists of Mathematics, an Aptitude Test and a Drawing test. The National Aptitude test in Architecture (NATA), the online test with drawing exam is conducted by the National Institute of Advanced Studies and Architecture in association with the Council of Architecture (COA). NATA scores are used by admissions authorities of different unaided & Government aided schools / colleges of Architecture, to provide common measures for comparing the qualifications of applicants. NATA measures aesthetic sensitivity, critical thinking, perception, observation and architectural awareness. 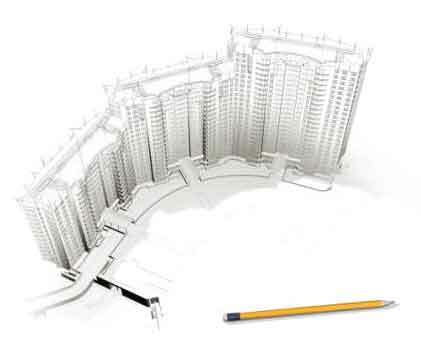 The main task of an architect is to design and execute the plan for construction of any building or area. The job scenario include site selection, field research and supervision, safety management, quality control, environmental planning, estimating and costing, supervision of construction work, interior decoration etc. The architect is the overall in charge for construction- his responsibility begins right from the designing and planning of the structure until the same is erected. A qualified architect, to work as a consultant or to set up private practice, must register with the Council of Architecture before starting their profession. The Councilof Architecture constituted by the government of India is charged with the responsibility to regulate the education and practice of profession throughout India besides maintaining the register of architects. This body along with the Indian Institute of Architects- the national body of Architects in the country, lays down the guidelines for working hours, work environment, fees etc.